Like many in Second Life I have fallen in love with the Water Horse Bento Riding Horse. 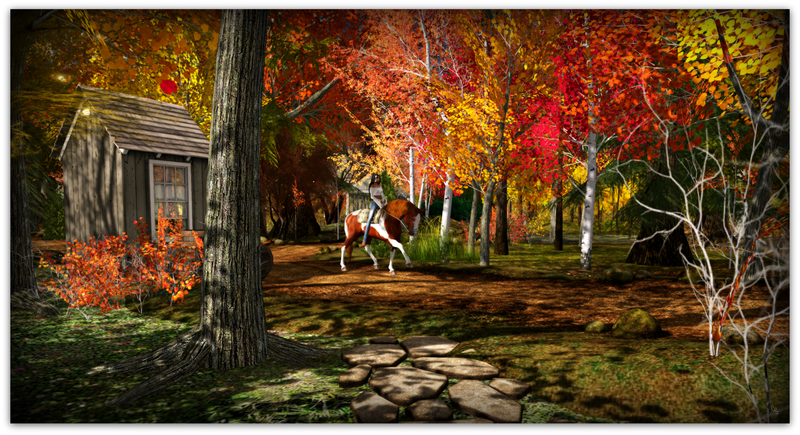 I’ve also enjoyed discovering areas that are conducive to riders and their horses. That information will be shared here. Evergreen Escape is a lovely region for horseback riding. The trails are easy to manuever and the fall scenery is beautiful. There are many places for photo opportunities, along with places to stop and cuddle with that special someone. While not as large as some riding areas, this is one of my favorites as it reminds me of the countryside where I grew up.